This book is just awesome and amuses me to no end. 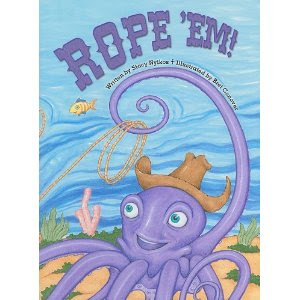 Rope 'Em!, written by Stacy Nyikos and published by Kane Miller, combines two of our greatest interests. ANY long term reader around here knows that Bookworm1 has been obsessed with sea creatures for some time. We have been inundated and drowned out with octopuses, sharks and whales around these parts. Then, recently, we've been learning about life in the Wild West as part of a thematic unit. When I saw Rope 'Em! (available through Usborne Books and More) I just knew we had to take a look at it! "Scout and Virgil were the O.K. Coral's best cowhands ever. Scout could herd any fish - feisty, frisky, even ferocious. And Virgil could rope and tie one in six seconds flat." Scout is a sea horse and Virgil is an octopus and the two work together to herd fish. However, one day, Bullface, the "biggest, meanest, hungriest bull shark for miles around," comes a'callin' and Scout and Virgil's partnership and skills are put to the test. This is an under the sea western story and the value of teamwork, cooperate and friendship. I think it's hilarious and, of course, Bookworm1 connected to it entirely right from the get-go! This is definitely a unique combination of themes for us but I think the story works well. We have enjoyed it thoroughly and now must share it with you all. If you get a chance to hunt it down and check it out - do! Thank you, Kane Miller, for sending this one our direction. It's a blast! so combining them to teach teamwork and friendship is a great idea. From the cover art, it looks like the illustrations are fun and colorful! What a cute combination of themes!! I can see why this book is a huge hit at your house! !